And here’s the second half of my top synths article, with the top five! These are the five synths I enjoy using the most right now in my music and sound design. Let me know what you think of my top ten. What gems am I overlooking? Always interested to hear. I have the feeling that Trilian often gets overlooked because it is assumed to just be a bass synth. An understandable outcome, given that it is described as a ‘bass module’ and is filled with outstanding synth and real world bass samples. But there is much more to it than that. Because it uses a very similar architecture to its big brother Omnisphere, you know that there are a plethora of controls at your mercy. So, as well as a multitude of basses and basslines, Trilian can also provide you with a unique angle for pads and soundscapes. And these can be sweet and organic, or gnarly and synthetic. 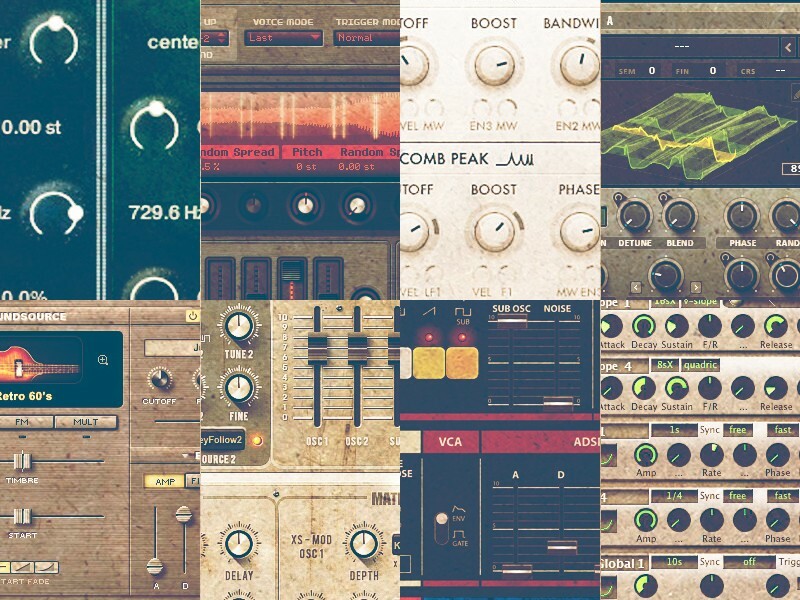 Beyond the amazing soundsources, there are very many ways to manipulate those samples. Great filters and modulation envelopes can help you control your sounds; whilst an array of effects options allows you to shape them. There’s also a pretty decent arpeggiator too, of course. I’ve just been working on a project that was focused on deep and dark basslines, and Trilian was the perfect tool to get me there quickly and with brilliant end results. The sound quality really is great. PROS: Fantastic bass sounds; huge array of effects and controls. CONS: Deep sampled soundsources can take a while to load; it is essentially, predominantly for bass sounds; some patches can be CPU intensive. I know a lot of people wouldn’t have quirky old Absynth so far up their list. However, I love this little synth, no matter how long in the tooth it may seem. There’s no question it’s showing its age. Some of the controls are very small and occasionally erratic, and it’s quite capable of spitting out results that don’t always make 100% sense! But perhaps that’s partly why I like it. For unusual and deep soundscapes and pads, it’s an absolute winner. It’s also surprisingly good at recreating analogue sounds, especially drifting, slightly broken ones. One of the best cards up its sleeve is that it loads samples, meaning you are never short of original sonic inspiration. It spits out some very odd sounds, but they can be tamed. The granular synthesis and cloud filter are sure fire winners. But be very careful with the Mutate button, it can result in noises that can puncture a lung or crack a skull! And not in a good way. PROS: A sound quite of its own; you can load your own samples; amazingly atmospheric. CONS: Controls can be very fiddly and sometimes overwhelming; prone to sound glitches; steep learning curve. Oh Diva… how many ways do I love you? We have entered the top three now and, for me, the last three stand out from the rest of the competition by quite some distance. Diva’s analogue-modelling architecture is second to none. It imitates analogue both sonically and structurally very effectively indeed. I you want, deep, organic synth sounds, it really is the go to synth. The sound quality really is magic. But, alongside that are some very simple controls, based on some classic hardware synths. If you come from a hardware background or want to expand into using analogue synths, Diva provides an excellent stepping stone in both directions. The simple oscillator/filter/envelope structure is very simple to navigate for the raw bones of synth patches; with some sweet LFOs and effects to provide the cherry on top. Little touches like the Drift and the Voice Stacking controls are great too, for when you really want it to sound like analogue hardware – warts and all! But all this comes at quite some CPU cost! Fortunately, u-he have had the great sense to have several accuracy modes, ranging from Draft to Divine. PROS: Amazing sound quality; best analogue modelling softsynth out there; very simple to use. CONS: Can be a huge CPU hit. Often seen as the grand daddy of all software synths, Omnisphere 2 is an absolute beast. There is pretty much nothing it can’t do, and does all of that damn well to boot. Drawing on an enormous amount of varied and extraordinary sample sources, plus a newly expanded synth engine, Omnisphere covers just about every sonic territory known to man. It sits at the centre of most professional studios for good reason. If you want to make a sound, any sound, you can probably do it with Omnisphere. All this power means it is an essential piece of kit. It sounds fantastic (although sometimes I find it can be a bit focused on some tricky frequencies, when it comes to mixing it into a track) and is useful for everything. Thundering basslines, esoteric soundscapes, eclectic percussion, terrifying drones, it does them all. Most of its functions are very well laid out and that makes Omnisphere pretty easy to use. It also has a very deep tagging system that allows you to find what you need quickly and accurately (and it needs it, because there are thousands and thousands of sounds in there!). If, for some mad reason, you only wanted to own one synth, Omnisphere would be it. PROS: Extraordinarily limitless options; superb browser; huge range of sonic capabilities; great sound design. CONS: Number of samples and options can be overwhelming; sometimes a little tricky to get it to sit in the mix. And here we are… number one. You might be wondering, after how much I waxed lyrical about Omnisphere, how it’s not at the top of the list? I’ll see if I can explain. I bloody love Zebra. I think it’s fantastic. When I’m writing music it is always the first synth to turn to in order to find a solution. And it rarely fails me. I love the sound of Zebra, and that’s what counts the most to me. It is also extremely deep. Incredibly deep. Too deep? Sometimes, perhaps. But, the sounds you can make with it are extraordinarily diverse. And it does all that, just using a synth engine: no samples. I love that. You can have four waveform oscillators, two noise oscillators, four FM oscillators; all running through eight filters (including two comb filters). All of this can then be controlled by a myriad of LFOs, envelopes and modulation maps. Add to that a nifty little effects section, a great arpeggiator, four X/Y pads and a big old modulation matrix. There is a ludicrous amount of sonic control at your finger tips. But, the most important things really is how good it sounds. It almost always sits nicely in the mix as well. Plus, it has the HZ version, or Dark Zebra, as specially designed for Hans Zimmer and Howard Scarr to use in the Dark Knight trilogy (and beyond, of course!). The HZ version adds some lovely analogue-modelled filters, taken from Diva, as well as some VCA compressors. It really adds some great darkness and punch. For me, it remains the ultimate synth. An absolute powerhouse that does the basic things beautifully and is complex enough to provide you with about a hundred year’s worth of exploration… should you need it. PROS: Brilliant, brilliant sound quality; complex and numerous options; lovely analogue touch with HZ version. CONS: Can seem very overwhelming to use; HZ version is a CPU hog; reverb could be better. No Serum or Arturia eeh ? I haven’t spent enough time with Serum to have it in my top ten yet. And I’ve never used any of the Arturia synths. I know a few people that like them though. I’m sure you have the analog vibe down with Diva. Can’t beat Diva for that analogue vibe. I’m currently making some really interesting, analogue-gone-wrong sounds with it! Pretty much. Used it a bit and enjoyed it, but don’t really want to be using software that’s no longer supported. Mad now that there’s been a lot of new Synths out and you had to revise your or update your list would Falcon be in the running? Have you just called me Mad? Haha. I bought Falcon but haven’t had any time to try it out yet. So many other things ahead of it on my ever-shifting ‘to do’ list!